Professional Staffing Group Does Halloween! After an exciting World Series came to a close the night prior to Halloween, many offices in Massachusetts were quiet on the 31st – filled with exhausted employees who had stayed up late many nights in a row to watch the Red Sox win the World Series. 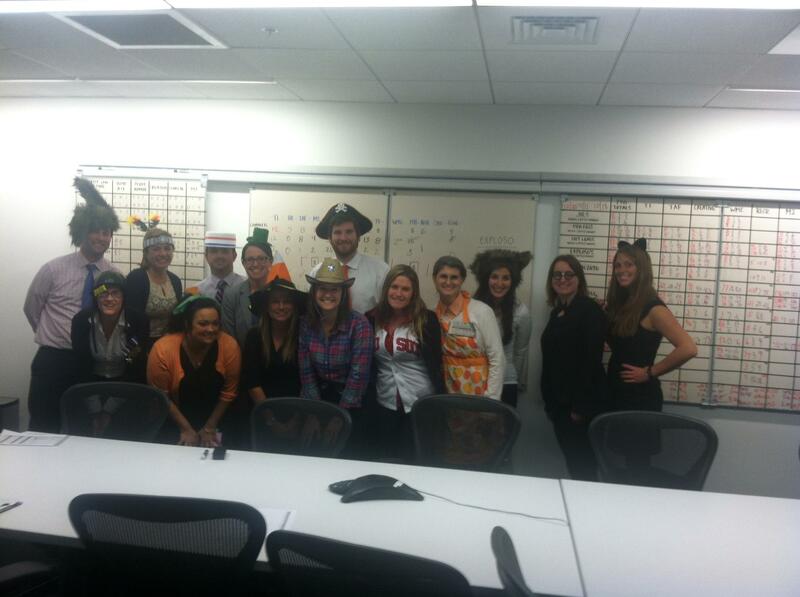 While many of us here at PSG did watch the game, the PSG office definitely was not “quiet” or “exhausted” on Halloween! In keeping with the spirit of Halloween, Professional Staffing Group encouraged employees to partake in some exciting office festivities! The day began as all other days, but when the clock struck noon, it was time for PSG’s trick-or-treating to begin. Each PSG team within the company was responsible for bringing in a homemade or store-purchased Halloween treat – the normal candies, as well as items such as pumpkin bread, cookies, and other baked goods were some of the highlights of the office trick-or-treating. The spirit of Halloween didn’t end there! We had a number of employees who wore costumes throughout the day at the office – we had pirates, witches, and much more. Below, check out some of the costumes that could be found around the office on Thursday!